Goldzone Wealth – Leave a Lasting Legacy while Living The Good Life! Leave a Lasting Legacy while Living The Good Life! The world’s best actors, athletes, investors, and business people have coaches. Most average and ordinary people see having a coach as unnecessary, expensive, and a waste of money. The world’s richest person, Bill Gates talks about everyone needing a coach. If a person with a net worth exceeding $90 billion believes in coaching, why not you? Check out the video below from a 2013 TED Talk. Contact an OPTIMA Coach today to transform your financial future! The venue for the next 3-Day GOLDZONE Wealth Weekend is the St. Regis Bangkok. We are excited to share this hotel and experience with you. BUTLER SERVICE > Do you have a butler at home? Have you ever wondered what it would be like to be waited on 24/7 with a dedicated team to cater to your every wish? Now you can experience full Butler service during the 3 days of the GOLDZONE Wealth Weekend. Most people feel uncomfortable have a Butler serve them, or a driver to wait for them. During the Wealth Weekend, you will learn what stops you and how to increase your ability to easily enjoy these experiences. The St. Regis Butler Service has been a treasured hallmark of the St. Regis experience for over one hundred years. From a perfectly pressed suit ready for an important meeting, to a favorite book at hand for an evening read, to a thoughtful, last minute gift for a loved one, no request is too small or unattainable no matter what the hour of the day. St. Regis Butler Service ensures that unique preferences are understood and addressed flawlessly at the St. Regis hotel Bangkok, your home during the Wealth Weekend! Upon arrival, allow a St. Regis Butler to arrange coffee or tea service in your room. And if you wish, a St. Regis Butler will arrive after your morning wake-up call to draw your shades, deliver your coffee or tea as well as the day’s newspaper and weather forecast. Complimentary in-room beverage service is available at any point during your stay. Once unpacked, simply let your St. Regis Butler know which garments require pressing and they will be pleased to assist, returning the garments to your wardrobe promptly. Two garments per person per day may be pressed complimentary. Honored to carry on a century of tradition of making guests feel at home, the St. Regis Butler Service Desk is available at every St. Regis hotel around the world. Should you need anything, at any time, please use the guest room phone to dial the St. Regis Butler Service Desk for prompt assistance. Give Your Wealth a Quantum Leap! One of my favourite subjects at school was economics. Understanding how the economy works is the foundation of creating your own financial success because we operate in a subset of the world, regional, national and local economies. The process or system by which goods and services are produced, sold and bought in a country or region. This video by Ray Dalio, Founder of Bridgewater Associates, shows the basic driving forces behind the economy and explains why economic cycles occur by breaking down concepts such as credit, interest rates, leveraging and deleveraging. I know what you may be thinking… it’s a complicated subject! You are right it is… I recommend you watch this video with friends and family, pause often and discuss what it means to you. In this way you will have more fun watching, the subject will be less daunting and you will remember more of it! GOLDZONE’s Wealth Education is available for free via this website, or if you want the fast-track, join us for a live event. The GOLDZONE Wealth Weekend is a 3-day immersion experience, or alternatively, join the 33 Pillars of Enduring Financial Success – an Interactive Digital Program from the comfort of your home or office. Time for you to accelerate your income, build your wealth, leave a lasting legacy and live a DREAM Life! This process totally transformed my relationship to money. 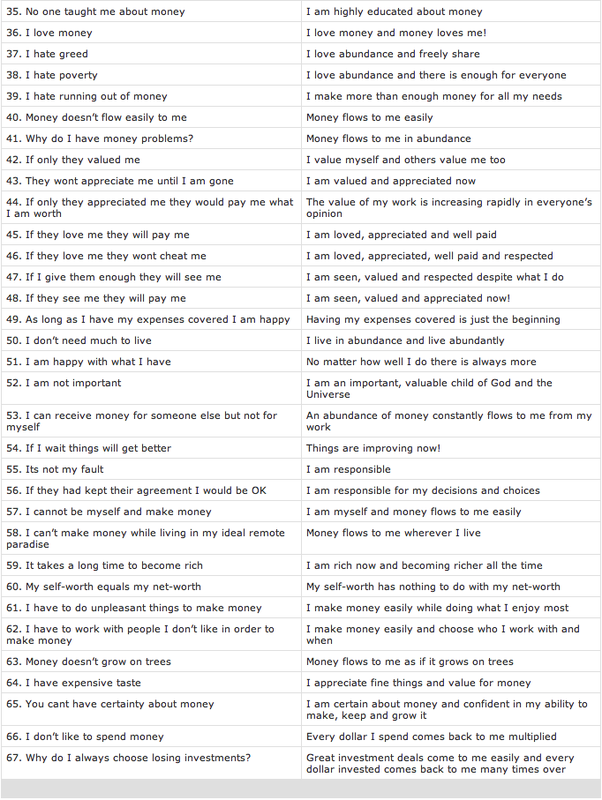 I highly recommend that you make your own list and pay attention to the thoughts that come up as you read the list below. Feel free to use any of these and add them to your list. GOLDZONE’s Wealth Education is available for free via this website, or if you want the fast-track, join us for a live event. The GOLDZONE Wealth Weekendi is a 3-day immersion experience, or alternatively, join the 33 Pillars of Enduring Financial Success – an Interactive Digital Program from the comfort of your home or office. Time for you to accelerate your income, build your wealth, leave a lasting legacy and live a DREAM Life! One of the foundations of personal freedom is economic freedom. Economic freedom is your basic right in any capitalist country. Economic freedom enables you to make your own economic decisions. This includes the right to own, use and profit from property (property is defined as anything you own such as money, real estate, patents, businesses, worldly possessions etc.) You are free to choose and change jobs, businesses, careers, and relationships. You have the freedom to save money and invest it as you wish. Most people neither understand nor fully exercise this basic freedom. Instead of thinking for and educating themselves, they abdicate responsibility for their personal economics to an outside authority – including partners and spouses. Anytime we abdicate responsibility to an outside authority we are giving up our basic freedom and becoming at the effect of someone else. This is the primary cause of failed partnerships, marriages, businesses and is the basis of one side of the money PLOT. The other side of the money PLOT is where we are the “outside authority” that others have abdicated control to. While we are in the PLOT we may achieve economic freedom, however, we will never have emotional freedom. Which means that we are not really economically free – because of our needs and obligations to be taken care of by other people – or to be the one taking care of other people. It is not possible to enjoy money for what it is – if it is mired in and intertwined with power, control, insecurity, lack, and limitation! There are many people teaching about money and how to build one’s wealth, however, there is very little effective support available to help one de-program, de-condition and de-hypnotize oneself from the core emotional aspects of money. This is more than a mental exercise, it takes examining one’s family background to fully understand and appreciate all the subtle and pervasive thoughts, beliefs and feelings that drive our money attitudes and behaviors. Then there is the metaphysics of money, wealth, and abundance. Many people think they know about metaphysics – and yet are unable to use this knowledge to financial advantage. The true test of knowledge is all in the application: if you can do it, then you know it. If you cannot do it – then you don’t know it. Our definition of wealth is way beyond the trappings of success, income generating assets, fancy cars, big houses and loads of cash. What good is financial abundance if one has no time to enjoy it, no energy and one’s relationships are bankrupt? Most people believe in their core feelings that you cannot have it all and that you have to sacrifice something in order to obtain wealth and all its trappings. This is absolutely not true. You can have it all. And you can have it sooner than you realize… by learning about and mastering the universal principles of what we call Goldzone Wealth! Your EXCHANGE reveals your FEELINGS. It is at the point of exchange that our money DYNAMICS are revealed and our true feelings about money show up. 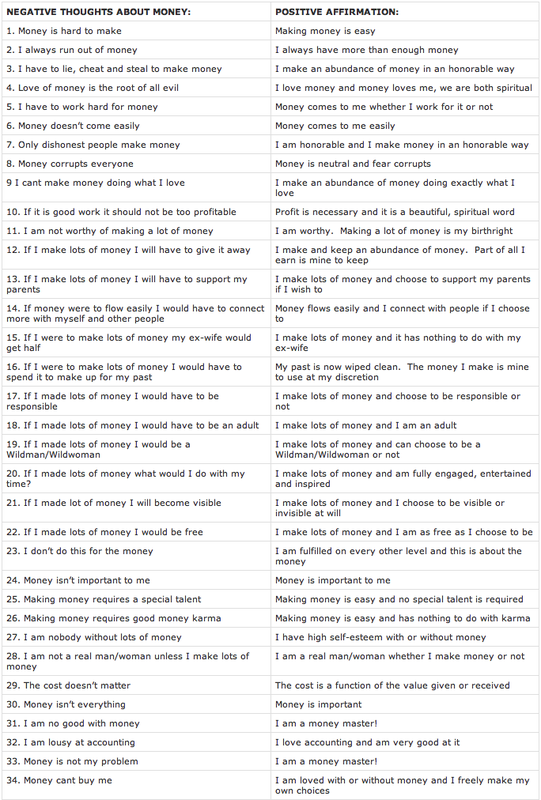 Many of us have a difficult time identifying and acknowledging our feelings about money. And yet it is these very feelings that drive our behaviors which ultimately create our results. The fastest way to identify our feelings about money (or lack of it) is to examine our exchanges with other people. It is very easy to say rationally that we believe in fair exchange and win/win – however when our money is on the line – our true feelings and behavior are exposed. Most people work hard to generate money, to invest this money in assets that then generate more money so that they can retire, live off the income, then enjoy the good life. The question is what would happen if you enjoyed the good life now? What is the good life anyway? Is it your definition or someone else’s? What would happen if you enjoyed what you did, were free to think, say and do whatever you wanted as long as it did not infringe on others? We are pleased to announce that we have established this new website: Goldzone Wealth to support you to master your finances, accelerate your income, build your wealth, contribute to others, live the dream and to leave an inspiring legacy for generations to come. We hope you enjoy it as much as we have enjoyed bringing it to you.